In business, it is always a good idea to keep things simple, so here is a simple but powerful way to make a lot of money using your FREE 100 SMS’s. Let’s divide the 100 SMS’s into four groups of 25. Step 1: Identify four services from your treatment menu that your customers love and must have on a monthly basis. For this example, let’s pretend that gel overlays, the hydrating facial, full leg waxes and hot stone massages are the most popular services or top monthly sellers in your salon. Step 2: Using the service groups on Salon Studio’s contact page, identify the clients who regularly buy gel overlays, leg waxes, hydrating facials and hot stone massages. Step 3: Now create a special offer for each of those treatments. 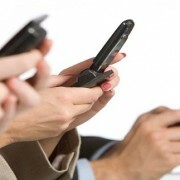 Make sure you read the 7 rules of SMS Marketing first. This article that explains in detail how to create SMS’s that work. Step 4: Send those special offers via SMS to 25 of your best and most regular gel overlay clients, your best leg wax clients, your most regular hydrating facial clients, your most regular hot stone massage clients. Step 5: Do this consistently on a monthly basis. Step 6: Watch your scheduler fill up with clients. If you use your 100 free sms’s strategically like the above examples, your 100 free sms’s will pay for your software and make you a profit. Simply put, use the software and you will never have to pay for it!